The next "it" thing in mobile is humungous, full HD screens. Every device we saw at CES was 5-inches and above, and all had 1080p displays. It's just where the market is headed, and it seems Samsung is very intent on joining that trend when it unleashes its Galaxy S IV. We don't know a single concrete detail about Samsung's upcoming device, or if it'll even be announced (it will). Still, there's a chance it'll arrive with the company's new Exynos 5 Octa processor and, according to Samsung, maybe even a screen with an insane 440 ppi. Samsung apparently shared a few details with a select group of media at CES, including a slide about the company's display lineup. On the far right is an unknown, a wild card: 4.99-inch (can we just settle on 5-inches at this point?) 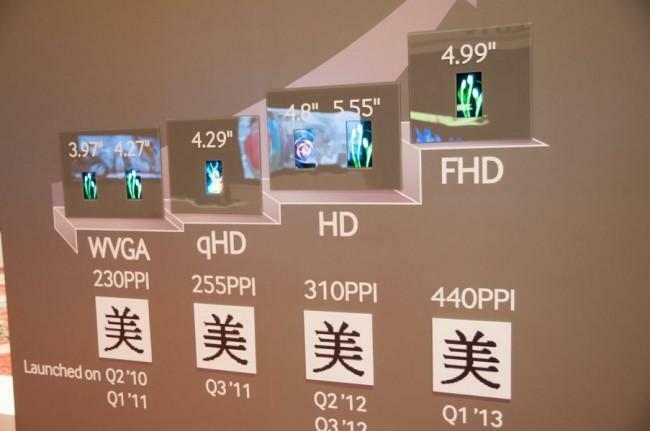 FHD 440 ppi screen, slated to arrive in Q1 of this year. What device could possibly come equipped with such a screen? The company didn't specifically attach any screen to any device, but there's high probability the Galaxy S IV will up the screen ante once it comes out. What else could it be? Hopefully we'll find out soon. But a 440 ppi screen coupled with the new 8-core processor sounds pretty good to us.